The project is developing infrastructures, which will reduce the number and severity of forest fires on the south face of the Sierra de Cantabria mountain range. Local proprietors will carry out the work alongside the provincial forest services. The south face of the Sierra de Cantabria mountain range has become extremely vulnerable to forest fires. The set of negative factors, which have caused this are: its continental Mediterranean climate with a prolonged summer drought, purely southern exposure, increased demographic pressure in the area, the inflammability of forest fuels, and difficulty of forest access. The primary aim is to develop a network of infrastructures, which, while minimising negative environmental impacts, will ensure the protection of forest areas in the event of fires through the separation of combustible forest materials. Further objectives include: improving transit routes for all types of vehicle, to aid people monitoring and extinguishing fires; and modifications which will prevent crown fires forming and resist propagation. The main activities will focus on creating fire barriers, to be mostly placed along forest trails. The fire barriers will be maintained through a pilot scheme launched in 2011 by a farmer on the eastern part of the mountain. The maintenance is to be extended in future years to all other fire barriers and will involve the rest of the localities farmers in the initiative. 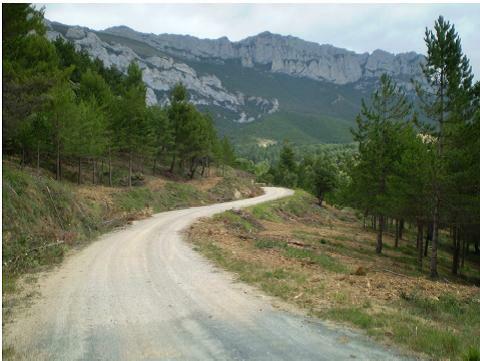 All work is carried out with the support and protection of personnel from the Provincial Council of Álava Forest Service. 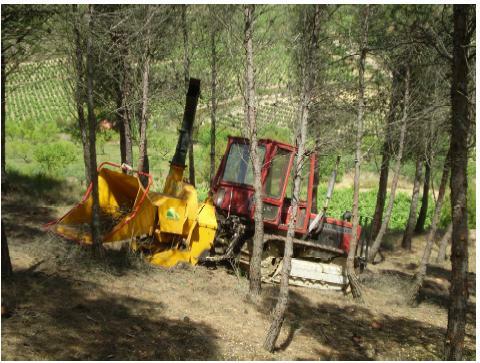 The anticipated result of the activities of the project is an improvement in the state of conservation of woodland habitats (gall oak groves and garrigues) that are of interest to the community located in the area of action. The improved health of the forests should lead to a reduction in the summer forest fires common to Mediterranean forests. The project is also expected to increase knowledge of forest management and ecological awareness amongst the forest owners. It is very important to seek the participation of all stakeholders. The procedure used in this project, in which the proprietors themselves have to apply for assistance and assume part of the cost of the works, has managed to involve them in the conservation of their forest massifs.